The following lists include the names of the valedictorians and salutatorians for both the junior high and high schools in Mt. Vernon, Texas, from 1907 through the current year. 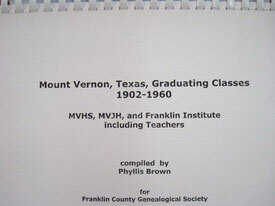 These lists are also included in the book, Mount Vernon, Texas, Graduating Classes, 1902-1960: MVHS, MVJH, and Franklin Institute, Including Teachers, compiled by Franklin County Genealogical Society member Phyllis Brown. The book is available for purchase; for more details, please visit our Franklin County Titles page. If anyone knows the names of the missing valedictorians and salutatorians, please contact FCGS member Phyllis Brown at pkwbrown@msn.com.